The shooting, the killing, the unfair treatment of minorities in the United States needs to stop. As an African American female, I am frightened as to what my future may be. The government blind and mutes’ American citizens. They will do anything it takes to make the bad look good and the good look evil. #TakeAKnee is a movement that started with NFL players, coaches, and owners taking a knee during the National Anthem to protest against racial inequality and police brutality. This movement begin when San Francisco 49ers quarterback Colin Kaepernick when he took a knee during the national anthem at a football game. President Trump then responded by saying “Wouldn’t you love to see one of these NFL owners, when somebody disrespects our flag, to say, ‘Get that son of a (expletive) off the field right now. Out. He’s fired. He’s fired!” (People are using #TakeAKnee to support NFL players after Trump’s comments, usatoday.com). He viewed that by kneeling during the national anthem was disrespectful to the country and those who fought for it. President Trump tried to turn something positive into something negative. Do you view the #takeaknee movement as something positive or something negative? NFL players take a knee during the national anthem by Jeanetta is licensed under a Creative Commons Attribution-ShareAlike 4.0 International License. I always find it interesting to hear what those who disagree with me are saying. Great article! 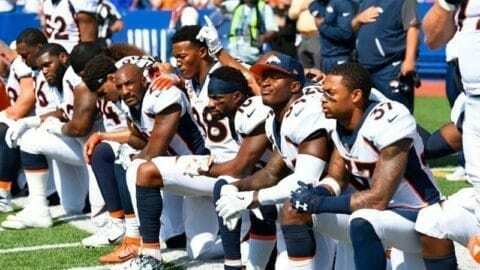 I personally think the take a knee movement is completely positive, and that as Americans we have the right to speak up for what we believe in. I have seen many comments from Donald Trump about the movement, and I think that he is trying to take the importance out of what the players are communicating. He doesn’t like that people are speaking up and hoping for change, but our country needs to change and grow to become better, and the only way that can happen is if we start to say something about what is wrong. https://www.nytimes.com/2017/09/25/opinion/colin-kaepernick-football-protests.html is an article coming directly from one of the players, and I think it offers a great point of view. I believe that players are right in taking a knee. They are not disrespecting the flag, and are peacefully protesting something that is incredibly relevant and dangerous to society. People think that it is offensive, and Trump’s involvement angers me. He reacted with such immaturity, that I am once again dumbfounded with how he got to be president. It isn’t about him. Its about how we can fix these problems.